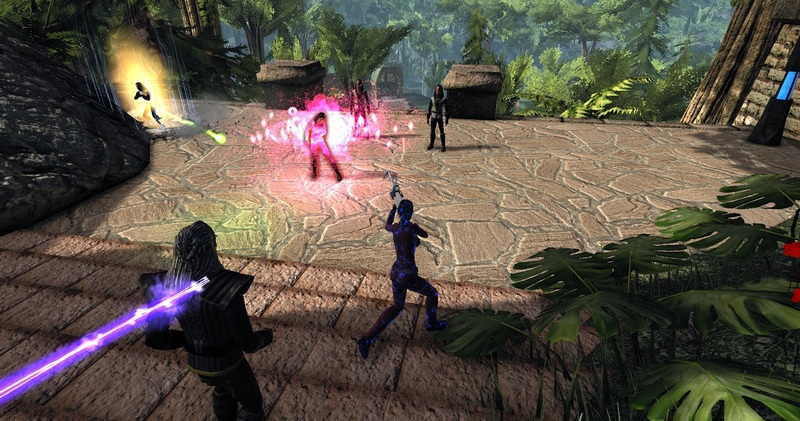 I got to check out Season 3: Genesis of Star Trek Online yesterday, following Blue Kae’s nice little guide to hit up all the new stuff. 1) After enduring months of jumping and twirling around on chairs looking like a complete spazzing lunatic, I finally got to sit down in my captain’s chair like an effing normal person. Look, I've just sat down and my blood pressure's still normal. 2) I never had a problem with the original Sector Space. I think most people hated the look of it, but all it mattered was whether it served its function and I always thought Cryptic deserved praise in coming up with this system to traverse space. What they did in Season 3 was more like a re-skin of Sector Space rather than an overhaul, but the difference is there. When you turn off the astrometrics data, space now looks and feels big enough to get lost in. Space actually looks like space! 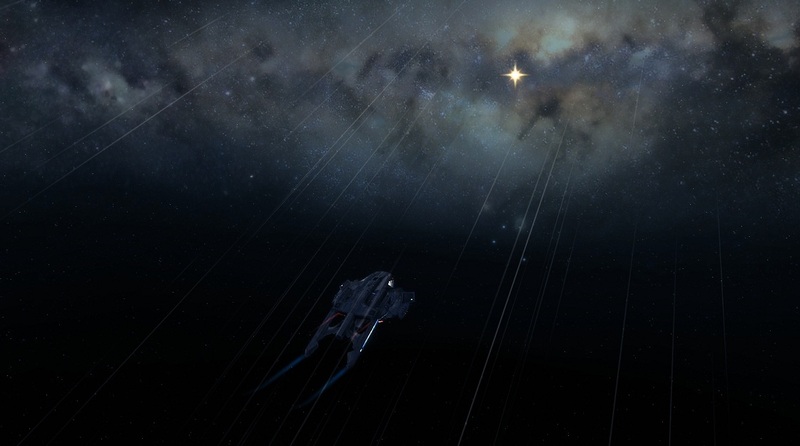 3) I did the new Emancipation daily from Deferi in the Orellius Sector. It was fun but I’m not sure that I’ll be doing it again. There are a lot of better ones to do, in my opinion, and even after fiddling with my graphics settings, ground combat in new content still crashes my game for some reason. Frozen again. Now I remember why I hate Breen. 4) Much of my time was spent in Episode Replays. I love this new feature for a couple reasons. For one thing, I did many of these older missions earlier this year and a lot of the time I was in a group. Don’t get me wrong, I love playing with other people, whether they be friends or strangers, but sometimes I just can’t keep up with them. I like to read everything, snap a lot screenshots, and in general take the time to absorb everything around me, but by the time I’m done the rest of my group is already two steps ahead. I didn’t want to be a burden, and rushed through a lot of these earlier episodes as a result. To be able to replay them now at my own pace is something I’ve wanted to do for a long time. The second reason? I played all these old missions on my old laptop and have since gotten a new computer. Like a geek, I simply wanted to experience everything on higher graphics settings. I'm a big fan of the sideways bunny hop. Nono, the sideways bunny hop is a different movie. Though it does allude to the plot of Star Trek VI. Yeah, that one was bad. I pooched the lyrics for the Time Warp from Rocky Horror Picture Show. They are, “It’s just a jump to the left, Then a step to the right.” Jump, bunny hop, time warp, STIV they warped back to the whales. Sometimes it’s best to just nod, back away slowly, and run when safe. Sometimes the quality of life updates are the best. Looks like you’re having fun. “Quality of life” updates is probably the best way to describe Season 3. Still not a whole lot in terms of things to do, but I’m waiting for the Foundry for that. I see your taking a breather from WoW hehe. Looks like fun, those missions. Beautiful screen shots. Don’t know if it will help, but I was crashing badly during ground missions too (I’m surprised Tipa didn’t lose her temper and boot me from the fleet, I got disconnected so many times while teamed with her) but I went to video options and clicked recommended settings. Everything looks the same, not sure what it changed, but I (knock on wood) haven’t had a single crash since. Thanks for the suggestion, others seem to have this problem and I think it’s something to do with the video card. I’ve been lowering and fiddling with the individual settings on advanced, it never occurred to me to just select recommended. I’ll try that. I checked it out, too. Sector space is beautiful, though I didn’t have a problem with the original. I didn’t realize the chair issue had been fixed, though. Whoopie! 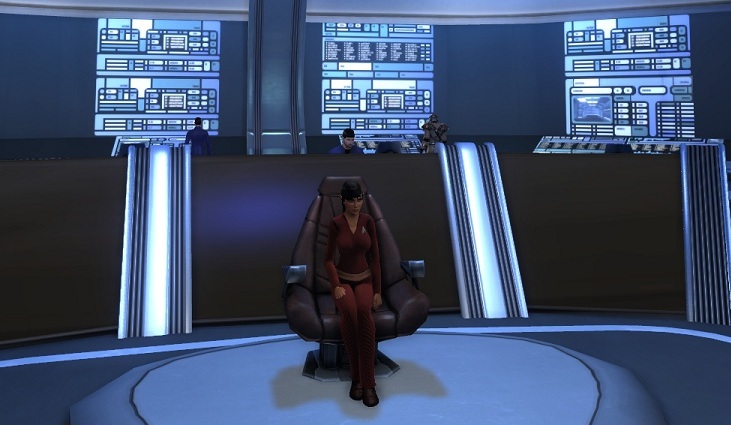 Yep, I sit so prettily and lady-like now, no more crazy clumsy fumbling into my captain’s chair. Ahh, that’s so nice.